Honestly, I don't remember when I start to fall in love with the Innisfree Second Skin Mask – Brightening edition (20g). The normal price is RM 20.50 for one sheet. Once I try it, I started feeling to like this kind of sheet mask. As you know, I have a combination and oily skin type especially when I stay in Kuala Lumpur, Malaysia but my skin will be change a little bit when I start traveling in cold weather like in an autumn, winter, or spring seasons. The Innisfree Second Skin Mask has five versions, which are brightening, moisturizing, nourishing, firming, and soothing. But my concern is for brightening at this moment and I only try the brightening version. The Bio-Cellulose is a fermented mask with an ultra-fine mesh-work structure that gives a comfortable fitting effect as if it was your second skin, along with a long-lasting moisture effect with strong moisture retention. It also keeps dull skin clean and transparent. After cleansing, use a toner to make your skin texture appear smooth. * The second skin mask has a sheet of bio-cellulose in between the two mesh sheets. Apply the stripped portion of the mask evenly across your face, taking care not to cover the area of your mouth and eyes. Remove the mesh sheet on that other side. The actual mask sheet is very thin and it's in between of the mesh sheets. It's has a light scent and smooth on my skin. After I let it absorb for 10 to 15 minutes, I dab the remaining ingredients to become absorbed on my skin. 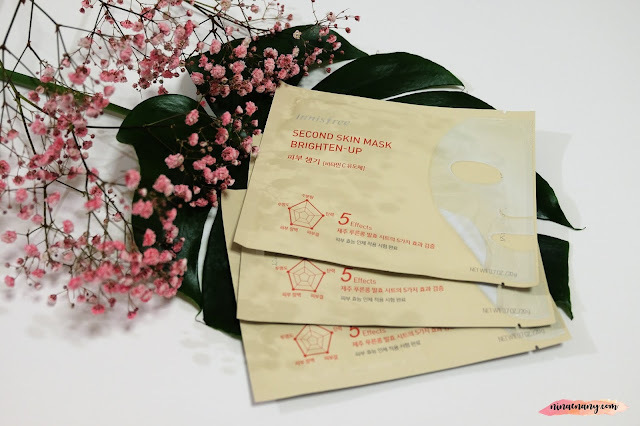 I like the result of brighter on my skin and it's let my skin look moistures without feeling oily after I use it rather than normal mask sheets. I was happy with it even the price is a little bit expensive. I would like to give 4 stars out of 5 stars for this product. Maybe I will repurchase after I run out the stock.